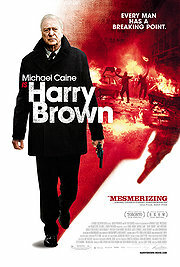 An intense little movie with just the role Michael Caine surely had wished for towards the end of his acting career. He plays a retiree, soon a widower. He has very little left in life that entertains him, and these things are taken from him one by one. At some point it is too much, and he does a Michael Douglas – a “Falling Down” Michael Douglas, that is. Not that he really would run amok, but he decides that he has had enough, and pulls together his plenty skills (good luck the authors remembered to give him a suitable back story!) to clean up the neighborhood. Despite the fact that the script is pretty contrived, and that the Caine’s character plays on the fringe of credibility, the film is tense and gripping. The atmosphere of peril and devastation in a random UK suburb is well caught on film, the pointless aggression may have looked exaggerated at the time of filming, but proved to be spot on a couple of months later when the British cities went up in random street violence. And Michael Caine gives his Harry Brown the sad, melancholic, bent look that comes with accepting the fate of an old age without too much perspective – and provides the interesting challenge to the viewer of whether to sympathize with a man full of rage and out for revenge.